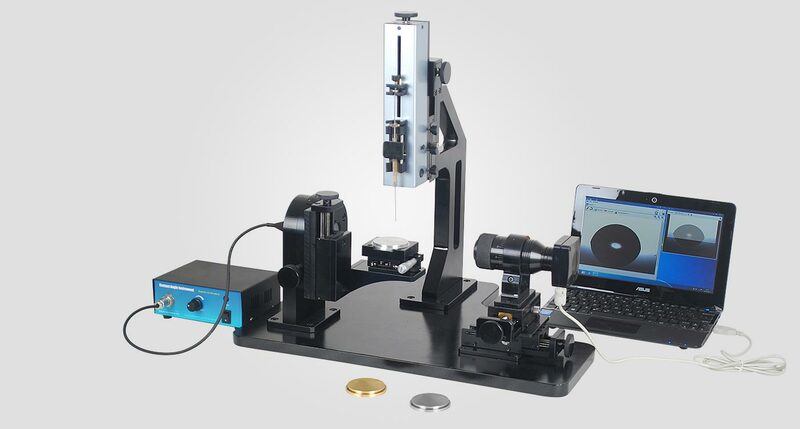 Holmarc’s Contact angle meter Model no: HO-IAD-CAM-01 is a basic educational equipment for illustrating the basics of contact angle measurement to students. 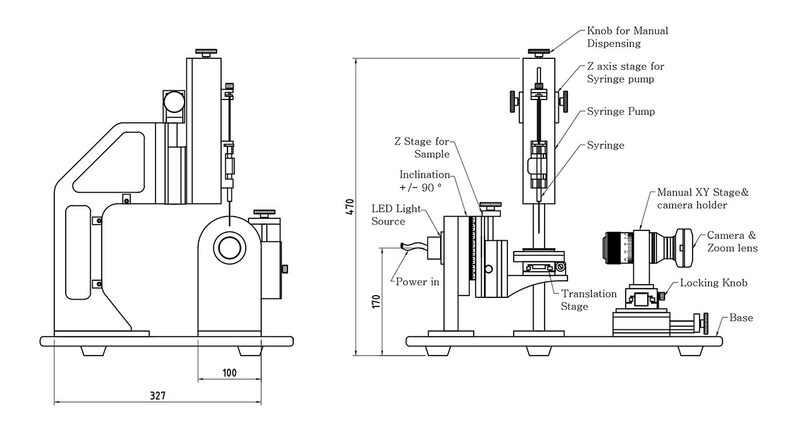 It has manual dispensing with camera interface for measuring contact angle of liquids on solid surfaces. 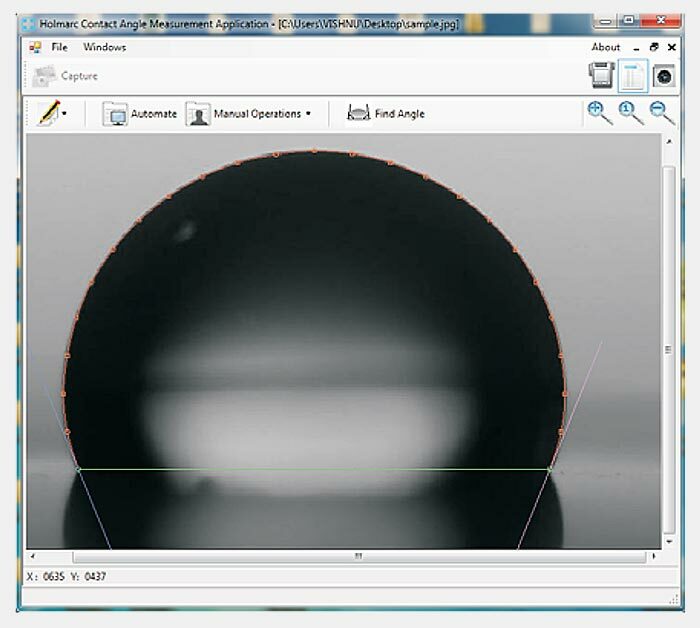 The surface over which contact angle is to be measured is held in horizontal position to find out contact angle using sessile drop method. State-of-the-art optics, precise opto-mechanics, high-resolution CMOS detector and associated electronics used in our instrument guarantee error free measurements. The intensity of the backlight illumination can be controlled in the control box. The wettability of a droplet is also dependent on the substrate in contact with the liquid. We provide 3 different substrates along with the equipment - made of aluminium, brass and stainless steel. However, the substrate according to customers’ choice can also be loaded into the equipment. Standard off the shelf syringes can be integrated from 0.4 to 20 ml, from any manufacturer. The equipment is compatible with glass, plastic and SS syringes. Three chromatographic syringes with 50 micro litre, 100 micro litre and 250 micro litre capacity are supplied along with the equipment. Dispenser : Mechanical dispenser with precise control. Other specifications : 15mm height adjustment for Sample holder. 90 degree rotation for the sample holder. 25mm XY travel provided for the CMOS - optics assembly. Rotatable screws provided beneath the base for fine height adjustments. To measure the contact angle of liquids over various solids. This is the angle formed by a tangent to the droplet at the point the liquid surface meets the supporting block. 5. Precision height adjustment provided at the test base. 8. 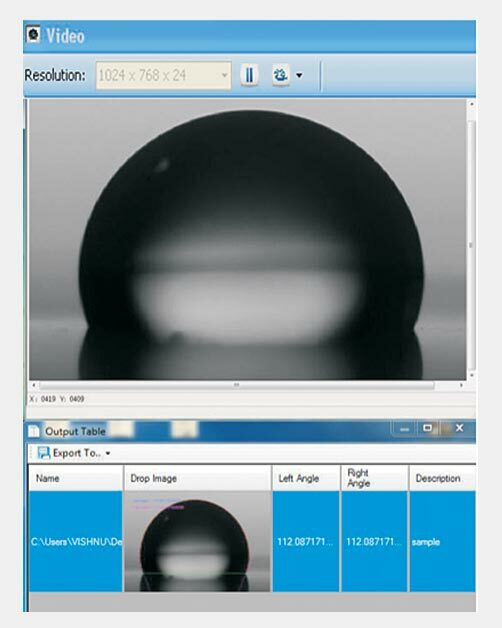 Live images can be viewed on the PC monitor showing the droplet on the solid surface reassures the operator-regarding validity of the contact angle measurement. 9. Video processing enabled software.